Pam shared our summer reading chart yesterday. When we made them I envisioned using them a little differently for our family. I have a plan this summer to make sure my boys are getting their jobs done before they are playing. I took a blank form and wrote their names on the top and then everything that needs to be done BEFORE they can play. 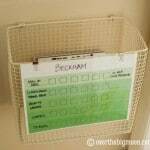 I have some baskets that I bought and put up for each of them in the hallway between their playroom and bedroom. You can download the blank charts in our Summer Reading Chart post! I wanted a place that their school folder, Scout book, Faith in God book, and their journal would go so we would always know where they are. Pam printed blank charts and laminated them for me. Then I used clips to clip them to the front of their baskets. Using a Sharpie I wrote their names and their chores along the left side. You can use a Sharpie on something that is laminated, you just have to use a Magic Eraser to get it off. We have been trying a new way to help our kids stay in bed at night – please tell me our kids are not the only ones that WONT stay in bed when its bedtime! How many drinks and times do they need to go to the bathroom in an hour! On the very top of their charts the left side says “Stay in Bed.” The right side says “10 minutes of Club Penguin.” Each night they stay in bed I put a check in one of those boxes. Thursday is Club Penguin day around our house, so now I add up how many checks they have and for each check they get 10 minutes to play. Last week there was exactly ZERO minutes earned! Oh goodness – there were some rough nights around our house! This week they have been way better since they were so sad that they didn’t get to play last week. Each of them have something different for reading. For Caleb it is reading for 30 minutes. Davis has to practice sight words, and Beckham has to read a book with me. We will be using our chore chart to track their chores. Although we have gotten rid of the reward system. I go back and forth on this. On one hand I think its a great motivator. On the other hand my kids think they should get something for cleaning up their stuff and I’m not okay with that. We all live here and they have to learn how to clean up after themselves. Any thoughts on rewards for chores? This chart is a great visual of what it takes to be ready to play each day. I think I’m going to make it a habit to put our Do not Knock sign up and when they get their chart done I will take it down. You can print the blank charts off in our Summer Reading Charts Post. 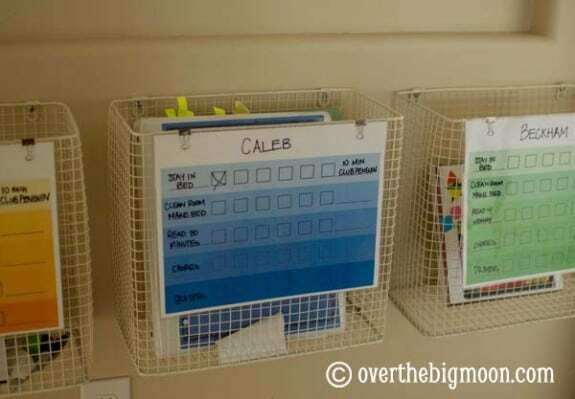 Love this system and will definitely be using your printable charts for summer chores/reading/good behavior incentives. Do you mind sharing where you bought the wire bins you have hanging that hold the binder and books? Love that! They were at my local homegoods. I found them at our Home Goods/TJ Maxx store. I wont lie – it took me a long time to find the perfect baskets. First time EVER that Amazon failed me! Pottery Barn had some that were similar but way out of my budget. If it helps at all they are magazine racks. For rewards what about….. after a certian amount they get to ….. This chore system works on so many different levels as well, for example, it’s not just the chores that get done. The kids learn how to actually do household chores, since everyone is doing something different each day, you have time to assist when someone doesnt know exactly what to do. They are also learning about saving and setting goals. Each time they turn in kisses for a reward, they check to see what they want to “get/earn” next. This helps them remember to keep up the good work, keeps things fresh (we have 3-5 things listed under each section) and teaches that if they want to go to that movie, they have to be strong and not go for something just because it’s “cheaper” so they will not have to wait even longer. So far this summer, it is working beautifully! The kids have to remind Mom to give them their kisses A LOT 🙂 Because Mom forgets but its all good. Good to know about the crayon! Thanks! So, I realize that this post is a month old, but I just wandered over from Pinterest. As far as rewards for chores go, we don’t do them in this house. My daughter has a schedule that I set up for her each day (she’s an only child and will be 5 next month) and part of that schedule includes chores. Depending on the day she will either have one or two “chore time”s scheduled plus the tasks of making her bed, picking up her toys, and animal chores which fall into their own separate tasks. Durring chore time, we have a rotating chore task system, where I’ve written all the things down that she is capable of doing on craft sticks, and she draws two or three (determined by me) and does those tasks. There are no rewards other than a job done. However in the chore sticks are random treats that say switch out one job, or put all sticks back no chores this time. So in the mundane can come the reward itself. It works so far and she knows she is simply expected to do those tasks. I think it helps her (I’ve heard far less whining about it at least) that there are lots of different tasks so she doesn’t get “board” with the same chores every day. In a year (maybe 6 months) I may start offering an extra reward (maybe a quarter? not at all sure yet) if she decides to do extra chores outside the normal chore time, but I find that unlikely as she’s like her mom in that she’d rather not do any at all lol. Love the idea for getting the kids moving in the morning. I too am working on that. Who is the artist of the Christ painting? I LOVE IT!!!! 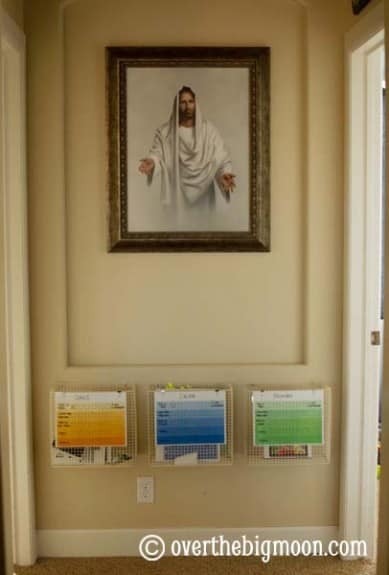 Never thought to put a picture of Christ at the end of the hall. Think I might need to do that. I love that picture too! The artist is Simon Dewey. I put it where the boys will see it often and I hope it makes just a little bit of difference in the way they feel when they go to bed at night. What a great post. I am trying to figure out a daily schedule/routine, with alternating things to do during the week (besides playing the Wii all day!) I think I would explain that as a family, we are all contributing members and we all have to work to be able to play. Also, my son DOES stay in bed. He has got up before a few times because he heard a strange noise. And I’ve brought him down a drink of water a couple of times, but that’s it. My question is this: how is it possible for you to work at home with your son(s) wondering what to do? I have only one son, so maybe my dynamics are a little different, but any ideas? I don’t know if you mean work as in this blog, or work as in chores? The thing that helps the most with my boys is that I have one old enough to help watch the others. I can send them all outside and I know that Caleb will keep an eye on Beckham for me, and Beckham is so thrilled to be included that he stays put. I do most of my blog work at night after they have gone to bed. I am so jealous that your son stays in bed!!! Usually I sit down at the computer in the morning, and then again after lunch when I let them watch a show to rest up. I also think it helps to welcome lots of friends. It keeps my kids so busy when they have friends over and usually the messes are smaller too! As far as chores go, it just never ends. I do have my boys work with me a lot though. I feel like I’m in the stage of life where its hard to get to the deep cleaning. My walls are driving my crazy. That is something I am offering $$$ for. If they want to earn some money- Wash a wall! Let me know if I totally missed what you were asking! Neat ideas. I like the stay in bed idea… Dave Ramsey has some great thoughts on kids and chores. First, they don’t get an allowance because that is paying them for existing – which you do by supporting them. 🙂 Then they have chores that are a part of life that thy don’t get any extra motivation for. Then, if they finish their regular responsibilities (the word chore denotes a bad thing!) then they have some option jobs for which they may be paid. I highly recommend his kid stuff. It also teaches them to save long term (college, house), save short term (video game, bike, big toy), give and spend. Another reason that I reward my kids is because that is the only way they earn money. So it gives me the chance to teach them about paying their tithing, putting money in their savings account, and then they have money that they can buy things they want at the store. Then I don’t feel guilty telling them that I am not buying them little toys at the store, they can use their own money if they want to. I reward my kids for chores – but, they are chores that I would have to do, not picking up their own things. My kids have to clean their own messes, but I reward them for things like: washing the walls, windows, door knobs, light switches, empty the dishwasher – things like that. They don’t get rewarded for saying their prayers, brushing their teeth, and picking up their own things. I think that is all part of living in this house and family. But when they do things that help ME out, that is when they get rewarded. 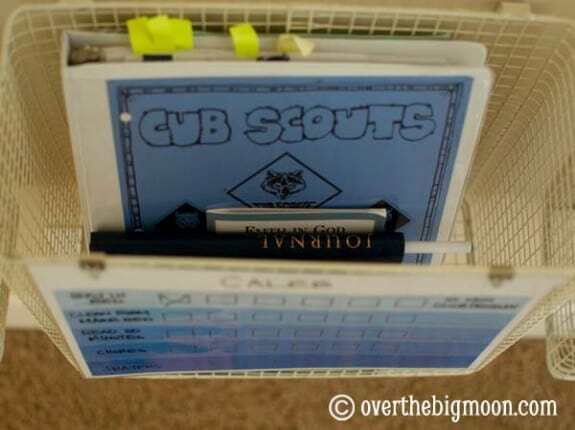 That folder was given to us by our Scout Pack and has all sorts of information for parents. I bought the belt loop packet at the scout store and added it to our notebook. That way when he wants to earn a belt loop or pin he can look in that folder instead of having to get on the computer. Our kids don’t get out of bed to sleep in ours – they just don’t stay in bed when its bedtime and need drinks, to go the bathroom, to tell us something, to anything other than go to bed!